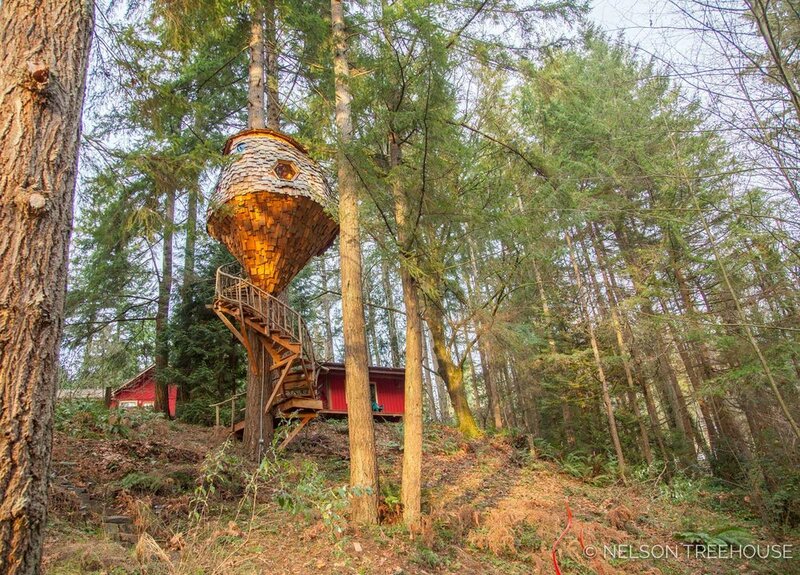 The Beehive Treehouse for Alison and Donald in Washington State is one of our all-time favorites. This project gave us a unique opportunity to design and build much of the structure onsite in an organic and spontaneous way. This week, we returned to the Beehive to photograph it - it's been over three years since its completion. The years have gently weathered the cedar shingles to a soft green hue, causing the treehouse to blend in even more with the surrounding forest. 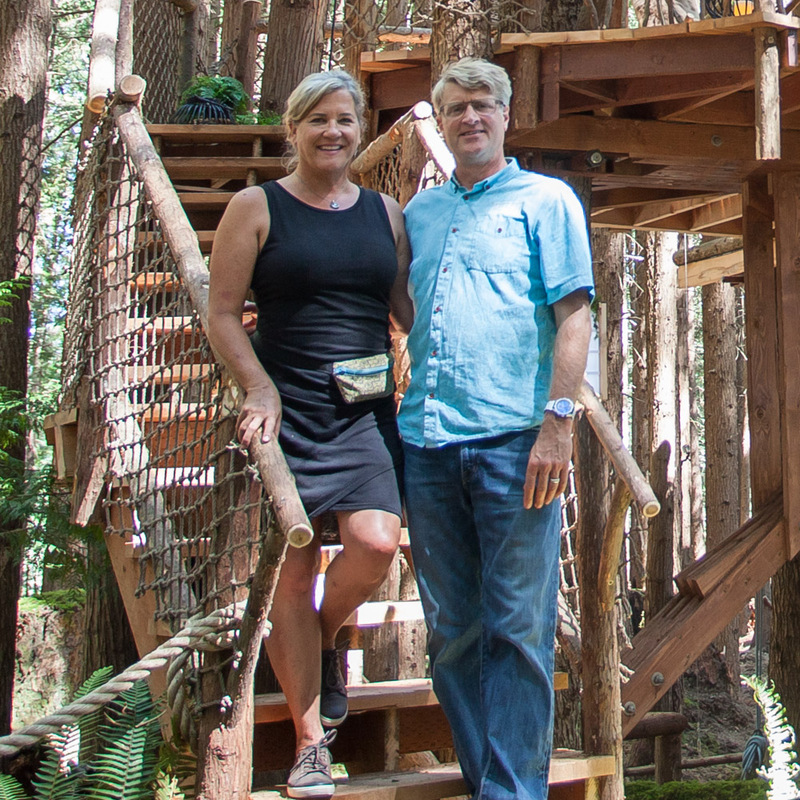 Originally from Scotland, Alison and Donald moved to Washington State a little over 15 years ago. The couple's verdant property is a menagerie of their own art installations and quirky structures. Just behind the treehouse, a bright yellow, elevated walkway winds along the forest floor to a London telephone booth. Atop an adjacent knoll lies a small room with framing comprised of distinct doors. And then there's the squat hobbit-like house, centered on a fireplace and lined with aromatic cedar. 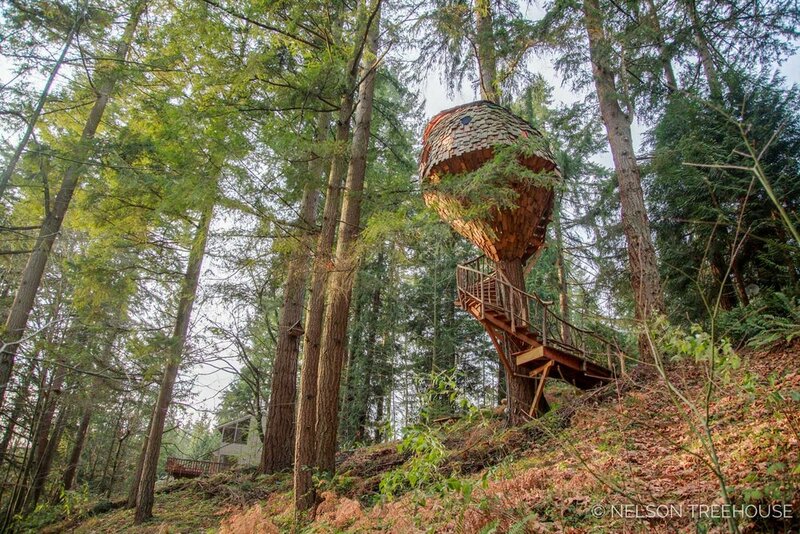 Alison asked Pete to design the treehouse like a beehive, with curved edges and honeycomb-shaped windows. As an artist, Alison frequently looks to nature for inspiration. 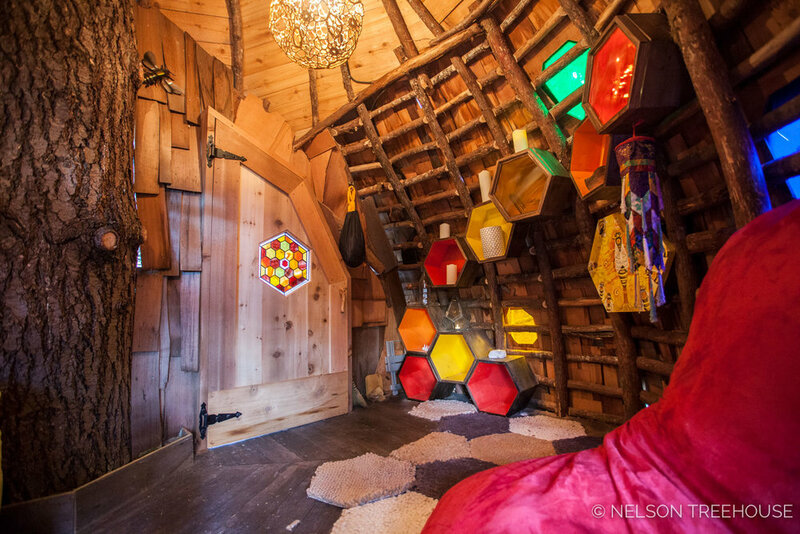 The strength and curvaceous quality of beehives captured Alison's imagination: beehives are a sort of natural treehouse. She and Donald planned to use their beehive as a quiet reflection and siesta space. In the summertime, Donald likes to nap inside a hammock suspended from the exposed framing. With the property's abundance of artwork, the treehouse is actually one of the last things your eye falls on: its intimacy with the tree, natural shape, and subdued color palette work together as camouflage. But it's impossible to look away once you've spotted it. Pete and the crew shaped the frame from natural cedar branches and sheathed it, along with the platform and knee braces, in mismatched cedar shingles. The finished treehouse is so intimately integrated with the Doug fir that hosts it that it looks like it grew naturally out of the forest. The Beehive nestles 25 feet high in a single, prodigious Doug fir measuring over two and a half feet in diameter. The crew built a standard platform around the tree, supporting it with a series of knee braces. Takashi ("Taka") Kobayashi, the renowned Japanese treehouse-builder, was the inspiration behind Pete's design for the front door. Taka's treehouses typically look organic, with many curves and lots of natural materials. Carpenter Ian Franks brought the door to life, and a local artist crafted the stained glass piece for the center. Up the winding staircase, inside the core of the hive, your heart rate slows and the senses take over. You notice the slight swaying of the structure, in concert with the tree. You hear squirrels running up and down the trunk. Even your breathing becomes audible - only because you've finally slowed down enough to pay attention to its rhythm. The whole experience of being in that place - both within the Beehive and on the artwork-peppered property as a whole - feels resoundingly surreal. Magical, even. A large, hexagonal window looks out over the surrounding forest. When the Beehive is illuminated by the setting sun, the many colorful windows bathe the interior in sultry, crimson light. Our crew used only cedar branches to build the "endoskeleton" frame around the treehouse, platform, and knee braces - this endoskeleton was then enveloped in eclectic shingles leftover from previous builds. The crew built a large scaffolding system in order to work on the framing, roofing, and shingling. Each panel of roofing had to be custom-cut to fit the organic placement of the branch-based frame. 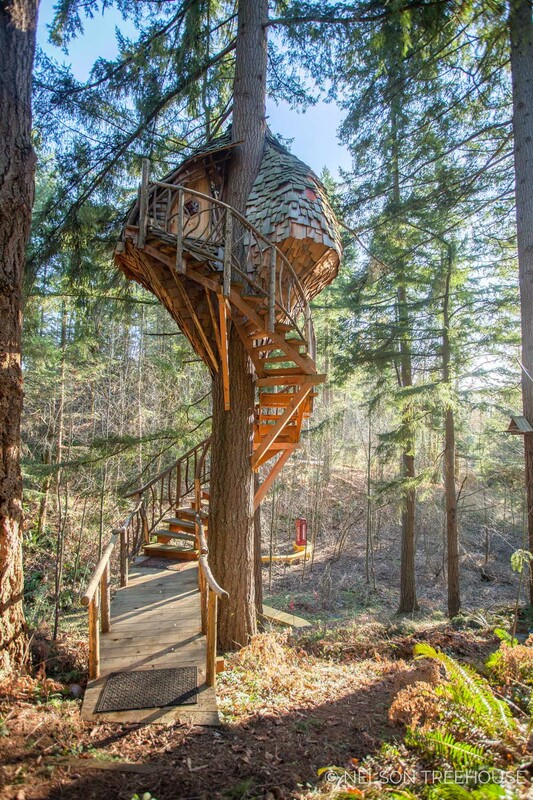 Chuck and Henry built the spiral staircase, which wraps 330 degrees around the Doug fir. Paddle tabs and knee braces support the beams for the stringers. Small lights embedded in each tread provide a subtle illuminated trail to the front door. Stay tuned for our coming blog post on Chuck's informational guide to building winding staircases! Revisiting the Beehive was a real treat - we hope you've also enjoyed taking a look at this whimsical masterpiece! Big thanks to Alison and Donald for a magical build and great photoshoot - we wish you a lifetime of peace and joy up in the trees.